This pie may not be quite as rare a treat as Thanksgiving coinciding with the first day of Hanukkah, but that’s probably a good thing since it means you won’t have to wait till the year 79811 to enjoy it. You can bake it as often as you like this holiday season, what with all the gourds and tubers that abound during these chilly fall and winter climes. And though it may sound like a lot of work, I can assure you that there is nothing so satisfying as roasting a pumpkin and then smashing it into a pie – as if to prove to the world that, hark, pumpkin pie does not in fact come from a can! Triple bonus points if you serve it up between today and Thursday on some dreidel plates. A half-recipe of your favorite pie crust, chilled. I used a tried and true all-butter. In advance: Cut sugar pie pumpkin in half, scoop out seeds, and place insides down on a foil-lined rimmed baking sheet. Cut yams in half and add the baking sheet. Bake for about 40-50 minutes, until soft and tender throughout. Scoop the pumpkin and peel the yams and smash with fork (or puree in a blender) until you have about 1 3/4 cups of pumpkin and about 1 cup of smashed yams. Set aside, or keep in refrigerator overnight if preparing in advance. Bake the Pie: Preheat oven to 400º F.
Roll out dough on generously floured work surface to make 12-inch circle about 1/8-inch thick. Flour liberally, fold in half, then in half again, and transfer to pie dish and unfold, pressing firmly and gently into the dish and leaving about 1-inch overhang. Refrigerate 15 minutes. Remove and fold overhang under itself; edge should be flush with edge of pie plate. Using thumb and forefinger, flute edge of dough. Refrigerate dough-lined plate until firm, about 15 minutes. Remove dish, line crust with foil and fill almost to brim with pie weights or uncooked beans. Bake on rimmed baking sheet for 15 minutes. Remove foil and weights/beans, then rotate dish ad bake 5 to 10 more minutes until crust is golden brown and crisp. Remove plate and baking sheet from oven. Set aside. Make the filling: While pie shell is baking, whisk cream, milk, eggs, yolks and vanilla together in medium bowl. Combine pumpkin puree, yams, sugar, maple syrup, ginger, cinnamon, nutmeg, cloves, and salt in large heavy-bottomed saucepan; bring to sputtering simmer over medium heat, 5 to 7 minutes. Continue to simmer pumpkin mixture, stirring constantly and mashing any chunks of pumpkin and yams against sides of pot, until thick and shiny, 10 to 15 minutes. 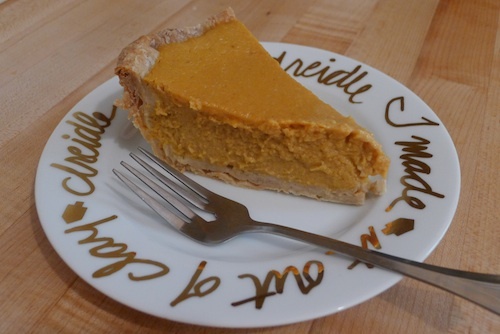 This entry was posted in Pie and tagged pumpkin pie. Bookmark the permalink. I made SK’s pie for Thanksgiving, too!